On Saturday 24 November 2018, the International Residual Mechanism for Criminal Tribunals (Mechanism) hosted the finals of the 18th Annual International Committee of the Red Cross (ICRC) All Africa IHL Competition at the Mechanism's premises in Lakilaki, Arusha, the United Republic of Tanzania. The competition was organized as part of the ICRC’s mission to promote further understanding of international humanitarian law and brought together teams of undergraduate students from English-speaking African countries. This year’s competition had a total of 10 teams from 8 African countries. The participants were assigned different roles in a fictitious humanitarian crisis in order for them to demonstrate their legal knowledge and skills. The finals were presided over by Mechanism Judge Vagn Joensen, Judge Faustin Nteziryayo, from the East African Court of Justice, Justice Thadeo Mwenempazi from the High Court of Tanzania, Dr. Eve Massingham, Regional Legal Adviser, ICRC Nairobi, and Mr. Hillary Kiboro, Legal Adviser, ICRC Nairobi. 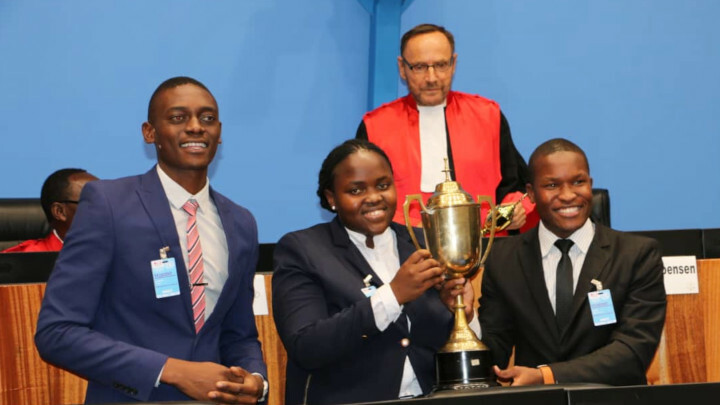 The winner of this year’s competition was the team from Midlands State University, Zimbabwe. The Mechanism, as well as its predecessor, the International Criminal Tribunal for Rwanda, has provided support to the ICRC All Africa IHL Competition for the past 17 years.